His Excellency Prime Minister Dr. Haider al-Abadi has said that there were those who did not want us to win and for the people of Iraq to see this day, but the steadfastness of the Iraqis and their unity have dispelled their evils. This came during the celebration of Baghdad, the capital of Arab media, where his Excellency has welcomed the Arab's media and journalists in Baghdad, indicating that Baghdad, which you see today, is not as you did hear about in the media. His Excellency has added that from the beginning, we have raised the slogan of liberating of the citizen before liberating of the land. Citizens are equal, and citizens are not considered as belonging. All citizens are first class. his Excellency has said :"The choice of Baghdad as the capital of the Arab media represents an enhancement of the freedom of the media, which we have worked to maintain and preserve despite our entering into a fierce war with terrorism,". Affirming the importance of transferring the truth and not mixed with lies because there is someone who attempts to spread sedition in the country. He added that when the word could unify hearts, nations and peoples, it could be a fatal bullet, pointing to the importance of commitment to responsible freedom. 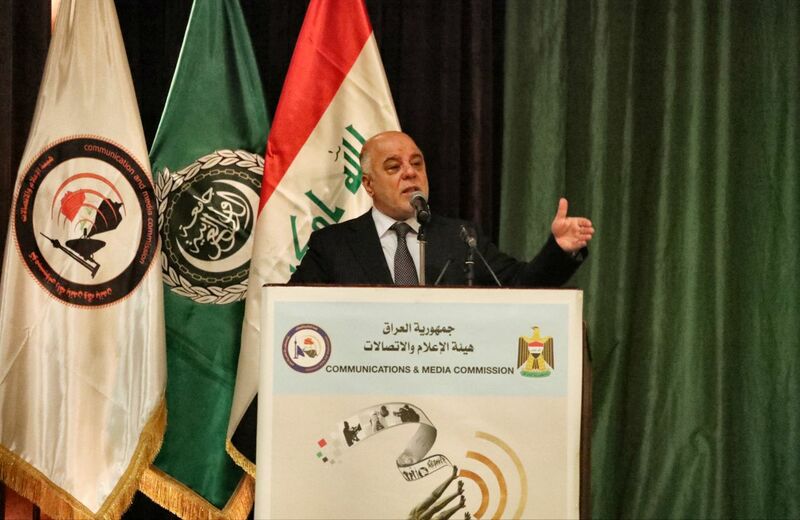 Dr. Haider Abadi has said that we do not want from the state to control the media, but we want from the media to press and say to the liars this lie, because there are those who exploit the freedom of the media to squander and defend the corrupters. His Excellency has pointed out that the corruption and terrorism twins both are groaning in the country, noting that the abuse of power is also corruption. "We have to stand up and say that there is a light in existence and that the truth and the bright side should be conveyed and give hope to our young people," his Excellency has said. Dr. Haider Al-Abadi has praised the martyrs and the wounded that we have won by their own sacrifices, including of them the Media's martyrs and wounded.